Have you made and decorated eggs with your kids? If not here are some wonderful ideas to create fantastic eggs! … Maybe some new traditions in your “egging” will be started with one of these ideas! Combine 1/2 to 1 Tablespoon of food coloring with 2 tsp. vinegar in a cup that is deep enough for the eggs. Add water approximately to the half way mark. Carefully place the eggs into the cups. To avoid cracking you can use a soup spoon to place eggs. The longer the egg is left in the dye, the darker the color. Experiment with different color combinations. Gently pat the egg dry with paper towel the egg and place it in a holder. You can make natural dyes by combining the below dye source with 1/2 Tablespoon of vinegar with some cold water in a saucepan. Put uncooked eggs and dye source in water that covers the eggs. Bring the water to a boil and then reduce heat. Simmer the eggs 9 to 15 minutes. The longer you simmer, the darker the color will be. Eggs must be simmered the minimum of 8 minutes to cook. You can’t always predict the results. But, it’s fun to see what happens. For a marbled effect, wrap the uncooked eggs in white and purple onion skins, spinach, and/or fresh saffron. Secure and wrap the eggs with white string and then place the eggs in the foot of a clean and recycled nylon stocking; tie the stocking in a knot. Gently boil the egg-filled stocking—using the same cooking time and vinegar /water mixture directions as above. After you remove the cooked eggs–leave them in the wraps awhile to deepen colors. To use this method, start with either hard-cooked eggs or blown-out eggs. Choose a dye-source. Some possible color sources for eggshells are listed above. Use judgment to how much of each source to use. Except for spices, place a handful – or two or three handfuls – of a dye-source in a saucepan. Add tap water to come at least one inch above the dyestuff. This will be about 1 cup of water for each handful of ingredient. Bring the water to a boil. Reduce the heat. Simmer about 15 minutes or up to an hour until you like the color. Remember that dyed eggs will not get as dark as the color in the pan. Remove the pan from the heat. With a very fine strainer (or cheesecloth) strain the dye mixture into a liquid measuring cup. Add 2 to 3 teaspoonful of white vinegar for each cup of strained dye liquid. Pour the mixture into a small bowl that’s deep enough to completely cover the eggs you want to dye. Use a slotted spoon or a wire egg holder from a dyeing kit to lower the eggs into the hot liquid. Leave the eggs in the water until you like the color. If you’re using emptied eggshells, stir or rotate them to help the color reach all the shell parts evenly. Lift the eggs out with the spoon or holder. Let them dry on a rack or drainer. 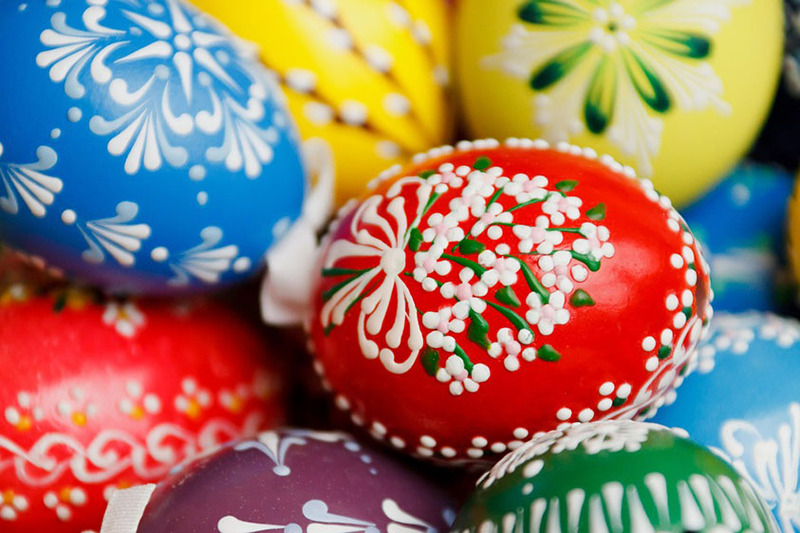 Eggs colored with natural dyes have a dull finish and are not glossy. After they are dry, you can rub the eggs with cooking oil or mineral oil to give them a soft sheen. TIP TO REMEMBER WHEN PAINTING EGGS …For a sturdy stand to hold the egg while you paint it, use an empty toilet paper tube. Prop the egg on top and decorate. Wrap elastic rubber bands around hard cooked eggs, then drop them in food-coloring dye. Remove the eggs; pat dry with paper towel; remove the rubber bands when eggs are dry. The parts of the egg covered with rubber bands will not be colored. You can STOP at this point or—-once the rubber bands are removed, you can drop the egg into a different color dye. Dip your egg in the color; when it’s dry, remove the re-enforcement. You have a perfectly designed egg! Mix SWEETENED condensed milk (such as Eagle Brand) with food coloring; paint with brushes or Q-tips. Coat bubble wrap with acrylic paint, then roll the egg over it. A jar of rubber cement can help make beautiful Easter eggs! This design is very simple to accomplish, even for children — with a some supervision…..Fun part! No two eggs are exactly alike. These eggs are really simple to make. The basic principle is that you drizzle rubber cement over the egg, let it dry, then color the egg. Naturally, the egg dye won’t stick to the parts that are painted with the glue. After the egg is colored to the desired shade, let it dry completely, then carefully peel off the rubber cement. You can paint the rubber cement on plain white eggs…or dye the egg with a base color, then apply the rubber cement and re-dip in a contrasting color. The most important tip is to dry the eggs completely between colors and or coats of rubber cement. The reptilian-like designs on these eggs are intricate; they look like they would be difficult to make. Not so…With a bit of help, even young children can get fabulous results. The best part is–no two eggs are ever alike. Wrap a piece of cheesecloth tightly around a dry egg, bundling the edges together and fastening them at the top with a rubber band or twist ties. Dip your paint brush or cotton swab and dip it into the egg dye, then dab this onto the cloth covered eggs. Repeat, painting the eggs with various shades in various places, use your imagination. Overlap some colors for special effects, or keep it monochrome. When you’re finished painting, set the egg aside to dry. The more patient you are and the more the egg dries, the better. When you unwrap the egg, you’ll be left with a design that resembles armadillo skin. You can use this technique over plain white eggs, over a base base coat of color or even over marble colored eggs. Another technique, which will give a subtle textured effect to a solid colored egg is to wrap the egg in cheesecloth, as per the instructions above, then dip the whole thing in the cup of egg dye. Let it sit until done to desired shade. Let dry (it doesn’t have to be bone dry, but the drier the better) before carefully removing cheesecloth. Use craft supplies such as yarn, ribbon and fabric scraps to create members of your family (or member’s of your students’ families) Attach with craft glue. Drip wax from a lit taper candle onto the egg. After the wax is set, drop the egg into food coloring dye. Remove the egg from the dye and paper-towel pat it dry. Cut a sponge (natural if possible) into small pieces. Pour acrylic paint into a shallow dish or onto wax paper. Secure the sponge pieces onto clip type clothes pins–you need one for each color of paint. Dip the sponge into the paint and dab the egg with it—Start with darker colors first for best effect. Place egg in an egg cup to dry. Mix 1 tablespoon food coloring with 1 tablespoon vinegar in a cup. Add 1 tablespoon of vegetable oil and 1/2 cup cool water. If necessary, add a little more water, so the liquid will completely cover an egg when placed in the cup. Make different swirled colors in different cups. Gently lower an egg into a cup using a spoon until the egg is completely covered by the liquid. Remove the egg immediately and pat dry with a paper towel. Your egg will have a marbleized look. FYI: The pictured eggs have a coat of clear nail polish on them to give a gloss. Use undiluted food coloring and a cotton swab to paint on hard boiled eggs. Let the eggs sit in egg cups until dry. Use acrylic paints and a cotton swab to paint on hard boiled eggs. Let the eggs sit in egg cups until dry. Do NOT eat eggs that have been colored with paint! With crayons, draw dots, lines shapes and swirls on the Easter eggs before placing them in the dye.The wax will resist the dye and your picture will show through. If you are dying Easter eggs with young children and do not want to use dye…The children can stop after coloring the eggs with crayons. Hard boil the eggs and let cool. Have children cut or tear diferent color of tissue paper into small pieces. Use water to stick the tissue paper to the eggs. Allow to dry. When dry, the children can remove the tissue paper to see the colors and patterns on their Easter eggs. Note – tissue paper for gift wrapping will not work in this project. The coloring in craft tissue paper transfers easily to the egg. Dye eggs in solid colors. Dry them with a paper towel. For each bunny egg, cut two oval shaped ears from colored paper. Glue the ears to the top of the egg. a nose and some whiskers. Glue on a cotton ball for a tail. 1. Using scissors, carefully cut out the image and paste it on the egg using all-purpose glue, cutting into the image to help it lie flat. Press out any wrinkles by gently rolling a round toothpick over the image. Wipe off any excess glue with a damp paper towel or cloth. 2. If desired, paint the background of the image with a wash of acrylic paint; let the paint dry. 3. Using a sponge brush, dab decoupage medium onto the egg. Let the medium dry. Repeat this step twice. Place one end of the dowel into the square of Styrofoam as a base to hold the egg while it dries. 4. If desired, embellish the egg with brush-on glitter paint, using a small paintbrush. 5. When the egg is dry, add finishing touches: Carefully cut off the masking tape, slide the egg off the dowel, and glue a gold finding at each end of the egg to cover the holes. Get out your water colors and fine paintbrushes and paint some pastel designs on your eggs. *Idea: You can buy EASTER STICKERS, and have the kids cover the eggs with those. How easy can it get! Whether you dye, paint, or decoupage your egg masterpieces, they’ll last longer if you blow out the contents and remove the white and yolk, leaving only the shell to decorate. 1. Remove the contents of the egg. Make a hole as small as 1/8 inch in each end of a hen’s egg. A mini drill and sharp-pointed cuticle scissors are good tools for keeping the holes small. Work over a bowl. The insides may start draining when you pierce the second opening. 2. Keeping the egg over a bowl or the sink, use an ear syringe to blow air into the egg and force the contents out the opposite hole. Rinse the egg with mild soap, water, and a small amount of bleach. 3. Slip empty eggshell onto a dowel. For decoupage, you want to avoid getting fingerprints on the eggshell, so slide it onto a 1/8-inch-diameter dowel. To prevent the egg from sliding, wrap a small piece of masking tape around the dowel just above and below the egg. BLOWING OUT EGGS THE OLD FASHIONED WAY! This idea is also fun at Easter! It’s not an egg to eat~ but still an egg! “Cascaron” is the Spanish word for eggshell. They are used in many celebrations including Easter, Christmas, Birthdays and Cinco de Mayo. …Now visit the ‘NON-EASTER’ EGG THEME PAGE! Crafts, Games, Recipes, Science and more! All using Eggs!! !